Have you ever thought about, or are you considering, selling your time as a WordPress professional, either as a freelancer or through finding paid employment? The two ways of working are quite different – one can involve a lot of autonomy while the other follows the more traditional model that people have been using for their careers since jobs were first invented (which I guess would be around the time of the Industrial Revolution). But they have one major thing in common: instead of producing something (a plugin, a product or a website, for example) which you sell to someone (a user or client), you’re selling your time. As a freelancer, you would be billing the hours you work for a client, while as an employee you would receive a salary. In both cases, you don’t own the thing you’re producing. Instead, you sell your ability to produce that thing for someone else. 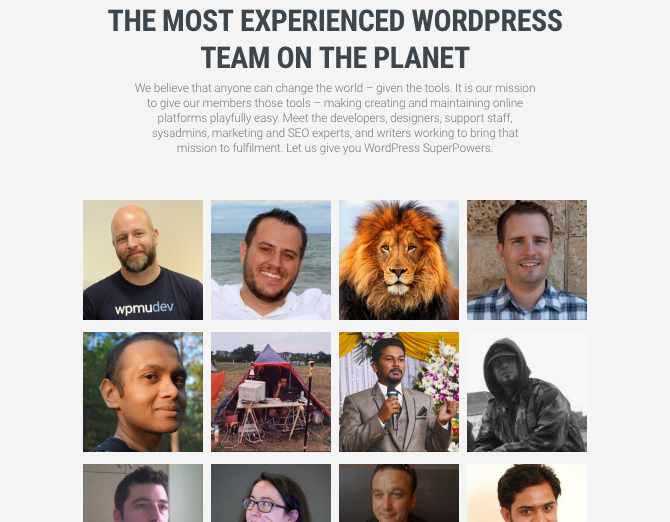 Welcome to the fourth post in this series on how to build a successful career with WordPress. In this part of the series, I’m going to help you decide if selling your time (and your skills) is right for you. I’ll look at the differences between freelancing and employment (and the shades of gray in between), with a view to helping you decide which is most suitable for you. Then I’ll give you some tips to help you land freelance work or a great WordPress job and make a success of whichever one you choose. And remember, during your career you might switch between different ways of working depending on your circumstances, skills, and the job market – so both employment and freelancing may be relevant for you at different times. And many WordPress developers do both concurrently, supplementing the income from their day job with freelance work they do at night. It’s a good way to get freelance experience before taking the leap into the unknown if you’re used to the security of employment, and of earning some extra cash. Employment can look quite different these days to what our parents might have done – it’s not always about the nine to five grind. And freelancing may not be what you expect: it doesn’t necessarily mean isolation and uncertainty. Here are some of the key features of each, and some of the possibilities afforded by each. Employment means that you work for an employer, which may be a company, a charity or a government organization. They could be big or small, and your job could be very general or very specialized. Your employer might specialize in what you do: they could be a WordPress development agency if you’re a developer, a marketing company if you’re a marketer, etc. Or they might be something different and you provide that expertise for them. For example, you might be a developer working on the website of a retail company. There are two big advantages to employment: security and being part of a team. You’ll get the same salary every month and you’ll be part of a team of people all working to the same end (hopefully!). If you like stability and company this will suit you. Freelancing means that people hire you to do work for them. Those people could be agencies working for clients, or they could be the clients themselves. The main difference between freelancing and selling a service is that as a freelancer you charge for your time. Some freelancers sell their time directly to clients while others go through agencies and others sell a service (such as a completed website) to clients, I’ll look at that in more detail in the next part of the course. The main benefits of freelancing are variety and autonomy. You get to do varied work for different clients and you get to choose what you do and what hours you work. As you become more experienced and in demand these will increase. As an employee, you might find yourself working alongside freelancers and vice versa. As a freelancer, you’re likely to be hired by the employees of an agency or client, while as an employee you might hire freelancers to boost the team’s capacity or skills. This means that the choice between freelancing and employment can be less about who you work for but more about the context in which you do that work. Each of these will impact own whether you’ll be better suited to employment or freelancing, and on how successful you’ll be at either. So let’s take a look at them in more detail. Working alone. If you’re comfortable working on your own initiative (and possibly alone), then freelancing could be ideal. But if you like to be directed in your work or you thrive on being part of a team, then employment could be a better fit. Resilience. As a freelancer, you’d need to be able to cope with the ups and downs of self-employment. As an employee, you may need to deal with the ups and downs of office politics. Self-development. As an employee your employer will support you in this: paying for courses, allowing time to study, providing coaching and mentoring. As a freelancer you’ll have to do it all yourself, unpaid. Motivation. If you’re easily distracted, working freelance will give you plenty of opportunities to procrastinate. If you’re the kind of person who needs external pressure, then employment may be a better fit. Flexibility. If you love flexibility and constantly taking on new things, then freelancing could offer you that. But if you prefer routine and certainty, then employment is more likely to give you that. If you’re a generalist, then employment by a non-agency employer is likely to suit you best. They’ll want you to look after every aspect of their website development, for example. This can be satisfying and give you plenty of control. Alternatively, generalists can get work selling a service to clients, which you’ll learn about in the next part of this course. If you’re a specialist, then employment in an agency or freelancing for one will probably suit you best. A large agency will employ specialist developers; smaller agencies don’t have the capacity to employ specialists but instead hire them as freelancers. If you do have a specialism, you’ll need to develop your reputation as an expert. And you’ll need to be adaptable: you may need to change your specialism as the web development landscape changes. Whether you can work freelance or as an employee may come down to where you live and the availability of work. 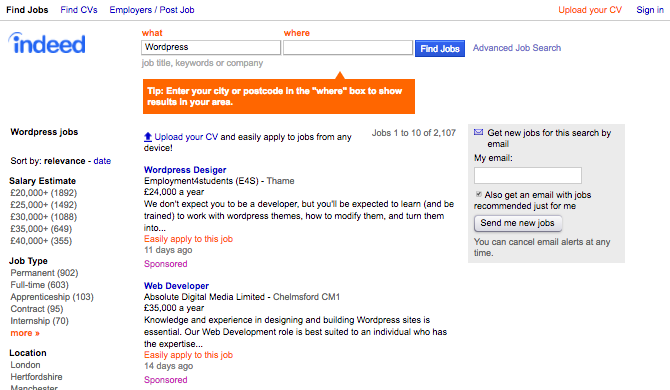 If there are few WordPress jobs in your area, then freelancing is more likely to provide you with opportunities. As a freelancer, you can work with people all over the world. I work for clients in four continents and it’s all done via Slack, email, and the occasional Skype call. I do have a few clients in my local area (one is just half a mile away) but you don’t need to confine yourself to local clients. So if you want to travel or work remotely, then freelance opportunities may be easier to come by. However, there are more and more employers, especially in the tech industry, employing remote staff. 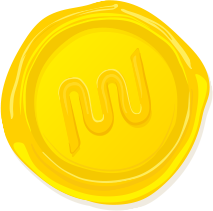 WPMU DEV is just one example: we have team members, both employees and freelancers, all over the globe. If your location is flexible, you could freelance from anywhere around the world. But if you like to work in an office with other people, then you’ll either want to get a job or find cowering space you can share with other freelancers. Working freelance is riskier than getting a job. You can’t guarantee that you’ll have work coming in next year, next month or even next week, and you’ll have to work to find clients and get contracts. If you do make a success of it, you can command higher rates of pay. Your clients don’t have to pay your taxes, insurance, pension etc. so they will pay you more. But you will have to manage your finances: you’ll have to complete your tax return, take the hit if you need a day off sick, and pay into your own pension. Don’t neglect these things! If you hate working with finances and don’t want to manage your own, then you’ll be much better suited to employment than to freelancing. The biggest practicality when it comes to employment as a WordPress professional is identifying the kind of job you want and that you’re suited to, and then landing that job. I’ve done research into what the big tech companies are looking for these days and have identified the main criteria they use. Without the technical skills for a given job, you’re not likely to stand much chance of landing it. All of the firms I researched ask for relevant technical skills and experience for all of their jobs. Examples include Apple, who expect applicants for developer roles to have experience with their APIs as well as other relevant technologies and languages; Facebook, who expect industry experience with the systems relevant to each role, and Automattic, who expect applicants to have a high level of WordPress knowledge. Startups are less likely to ask for many years of experience, as are smaller firms. Generally, the giants will hire the people with the most experience, while companies that haven’t been around so long will value personal qualities and potential. Most companies are looking for people with communication skills, even in roles that are purely coding-based: this is so that you can work effectively with other team members and communicate with your colleagues. Microsoft expects you to be an excellent communicator, Automattic expects all its team members to spend time supporting customers, and Buffer has 10 Buffer values which include listening and communication. As well as communication skills, many companies expect you to have other personal qualities or to share their values. For, example Facebook will expect you to be bold and agree with them that “the riskiest thing is to not take risks,” while Slack values diversity, experience, gumption, and panache. Analytical and problem-solving skills come up a lot: Apple mentions these in most of their job descriptions as do Microsoft and Facebook, who talk about curiosity. Automattic values problem-solving abilities among other personal qualities. The ability to work in a fast-paced environment and respond quickly is important: Facebook hire people who can move fast, Automattic specify flexibility, Apple need you to be comfortable with rapidly evolving requirements and Buffer want you to be a ‘no-ego doer’. Being self-motivated and able to work with minimal supervision is important too, especially at companies with distributed working like WPMU DEV. Google lists three attributes they look for: leadership, thinking style, and “googleyness”(!). It’s clear that fitting in with Google’s mindset and culture is key to landing a job there. The level of qualification required varies, with the more established companies or those working with enterprise rather than consumers tending to be stricter. Apple, Microsoft and Slack all require a Computer Science degree or equivalent for developer roles. Facebook’s criteria vary by role, with experience and skills being a higher focus. Some companies are just as happy for people to be self-taught: Automattic doesn’t mention a degree as a requirement while Buffer state that being self-taught can be just as valuable. But there’s no doubt that a degree will give you some advantage. So you understand what companies are looking for and you know your own skills and experience. Look back at the career plan you started working on in Part 1 of this course to check what you might need to develop and where your strengths are. And find a way of articulating your skills and experience that works for the company you’re applying to. Make sure everyone you know, both personally and professionally, knows what you’re looking for and can pass on any opportunities they spot. Prepare your CV and business card so you can give people something when you make contact. And make sure you follow the instructions an employer provides when applying to them: if they have their own application form, don’t send a standard CV. And if they ask for specific skills, attributes and experience, make sure you talk about those in your application. When I’ve applied for jobs in the past, I’ve developed a CV but I’ve always tweaked it for each employer I apply to. Employers like to know that you’re done your homework and know what they’re looking for. Tell them why you want to work for them and why you’re a good fit. A hiring manager faced with a standard CV is much less likely to notice you. And finally make sure you check out our post on the places to find WordPress jobs, and sign up to all the relevant jobs boards. When it comes to launching a freelance career, you have some different practicalities to consider. In common with getting a job you’ll have to brush up your CV and find opportunities, but you’ll also need to start managing your own business and become adept at marketing. Hourly rates. Identify what you need to earn per hour to cover your living expenses plus the costs associated with working freelance and the time when you won’t be charging for your work. Be realistic: follow our guide to setting freelancing rates. Marketing. Find opportunities to tell people about what you do. Develop your website and CV. Keep in touch with previous clients – they might want to hire you again. Networking. Attend events like WordPress meetups to find potential clients and collaborators. Contracts. Make sure you have a contract for every piece of work you take on. Your clients may have their own standard contract. There are tips for developing your own contact in the next part of this course. Finances. Set up a separate bank account for your freelance work and use it to manage work expenses. It’s also a good idea to set aside money for taxes and contingency funds. Legalities. Depending on your country, you may need to register as self-employed or set up a company for your work. Research this and make sure you do what’s required. Workspace. Your clients may require you to work on their premises or you may need to find out r own place to work. This could be anything from a cowering space to a table in a coffee shop, or a space at home. Think about your comfort sitting at a desk or table all day and make sure you look after your back. Self-development. It’s tempting to spend all your time on chargeable work, but you should never stop learning. Set aside time for self-development and be strict with yourself. If you don’t keep up with new trends, you’ll lose work in the long run. For more on the practicalities of setting up a business, writing contracts and marketing, amongst other things, see the next part in this course, on selling a service. The phrase ‘selling your time’ does, I admit, sound a bit dull. Especially when compared to the excitement of launching a startup or selling themes and plugins while you’re on holiday. But both freelancing and employment can be very rewarding. Freelancing gives you then opportunity to try new things, work with different people, and manage your own time and priorities. While elopement gives you the benefit of being part off a team and contributing to larger projects which you can see through from start to finish. Which you choose at any given time will depend on you: your personality, your circumstances and what’s available. But if you take some time to identify what will suit you best, and to prepare to make a success of it, then it will be much more rewarding. Are you thinking about a career in WordPress, either as a freelancer or through finding paid work for an agency? Share your tips for finding work in the comments below!